What if I don't like my selections? JustFab is a personalized shopping experience that gives you access to celebrity stylists and their hottest picks. Every woman deserves to have the season's latest trends and style expert advice regardless of her location, schedule or budget. So we combined the convenience of online shopping with the luxury of having a personal shopper. Our team of style experts keeps you on trend by handpicking a selection of gorgeous accessories every month based on your personal style. You'll get the season's hottest shoes, bags, jewelry and more for a fabulous value! When making a purchase you may elect to enroll in our VIP membership program. As a VIP member, you'll receive members-only pricing starting at $39.95 USD as well as other private perks. 1. Shop or "Skip the Month"
The choice to shop is always yours! If you need more time to shop or have decided not to purchase, click the "Skip The Month" button in your boutique by the 5th of each month and you won't be charged. You can "Skip" as many months as you want! If you don't shop or "Skip the Month" by the 5th of each month, your credit card will be charged $39.95 USD on the 6th for a member credit until you cancel. If you're not completely satisfied with your VIP membership, you can cancel it at any time by calling our Member Services Team at (866) 808-4003. • Over 3.6 million members can't be wrong! Create a style profile to help our stylist get to know you better. New shoes and handbag options are handpicked just for you each month. Buy what you love styles from $39.95 USD! 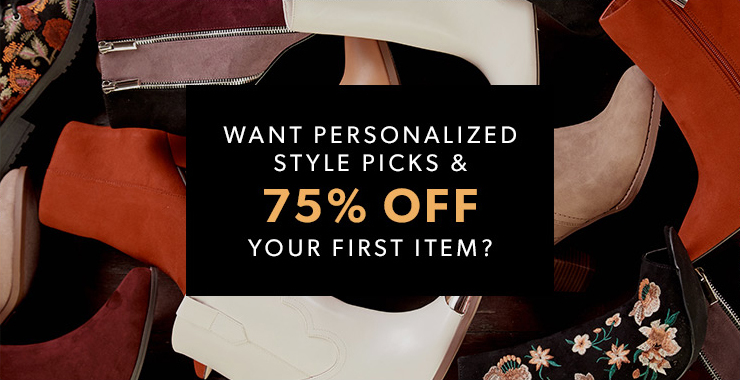 If nothing in your personalized Boutique catches your eye, then request new styles by clicking the Send Me New Options button. Simply fill out the request form to help our stylists determine what you'd like to receive. Then they'll head back into the JustFab closet to find styles that match your request. You'll receive an email when your new selections are available. Please allow 24 hours. No, there is no obligation to buy. We've made it easy to skip any month. Simply visit your Boutique between the 1st and the 5th of the month and select the Skip This Month option. You won't be charged and no member credit will be generated for you. If you have a change of heart and would like to make a purchase later, you can visit your Boutique at any time and make a selection even after you've skipped the month. You can only skip the month by visiting your Boutique; at this time, customers are not able to skip the month via voicemail or email. You can Skip as many months as you like. All orders to Canada are sent via standard shipping and are charged a one-time shipping and handling fee of $6.95 USD. There is no cost for shipping on exchanges and returns. Shipping takes 6 - 10 days for delivery. To help you save on shipping costs, no detailed tracking information is offered at this time. Orders are typically processed within 2 business days. As soon as your order ships, you will be provided with a tracking number via email so you can track the status of your shipment. If your order is sent via standard shipping, expect it to arrive within 7-10 business days. If your order is sent via Guaranteed Express shipping, expect it to arrive within 2-3 business days. You will also find your order details and tracking information on the Order History tab within the My Account section. JustFab accepts all major credit cards, including Visa, Master Card and American Express. We cannot accept personal checks or money orders. JustFab strives to provide superior customer service and a quality shopping experience to all of our members. If for any reason you are not satisfied with your selection, you can exchange it for another style or return it for a member credit or store credit. Due to our fabulous pricing, we are required to charge a $5.95 restocking fee for all items returned for a refund. We accept returns up to 30 days from date of shipment for items that are in new, unused condition and have all of the original packaging intact. Visit our Shipping & Returns page for more information about our shipping and return policies. We work with industry insiders to design our own styles based on the season's biggest trends. We work with the makers of Marc Jacobs, Steve Madden, Aldo and Nine West to provide you with styles made from high quality materials. By going directly to the source, we are able to offer shoes you'd normally pay $80-$120 for at a fabulous price. You may cancel your JustFab VIP Membership at any time. There is absolutely no cancellation fee. If you would like to continue receiving selections, then just skip the month by clicking Skip This Month in your Boutique between the 1st and the 5th of the month. You won't be charged and no member credit will be generated for you. If you no longer want to skip the month, then call our Fashion Consultants at (866) 808-4003 24/7 (24 hours a day, 7 days a week) to cancel your VIP Membership.